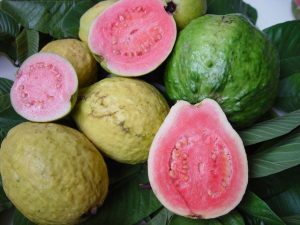 In today’s blog post, I would like to highlight the Guava which is quite famous in Guadeloupe Archipelago. First of all, let’s find out where it is coming from. The tree has been introduced in the archipelago by the Arawak Indians quite a long time ago. Guavas are native to Central America and belong to the Myrtaceae family along with cloves, nutmeg and cinnamon. This exotic fruit mostly grows in tropical and subtropical regions. With its unique flavour and smell, it is also a nutrient-dense fruit. In Guadeloupe Archipelago, there are many Guava recipes as the fruit is widely part of the culinary heritage. The Guava tree is a perennial plant with multiple dark green leaves. This low evergreen tree reaches between 3 to 6 metres long and lives for approximately 35 years. The fruit can be oval, pear-shaped or round depending on the variety. Furthermore, the skin is usually green before maturity and becomes green, maroon or yellow when ripe. The flesh varies in colour from white, pink or red. The Guava fruit contains several tiny edible seeds. Regarding the taste, it is a cross between pears and strawberries. In Guadeloupe Archipelago, the most popular is the Common Guava also called Lemon Guava. Apple and strawberry guavas are 2 other varieties in the archipelago. Guadeloupe Archipelago’s gastronomy is rich and diversified, Guava is one of the star fruits. There is a wide variety of recipes made from this sweet and delicious exotic fruit. But first of all, you can slice and consume it raw. You can also use it as an ingredient for various alcoholic and non-alcoholic beverages including juice, syrup and punch. Guava jam, jelly, yogurt, sorbet, ice cream, fruit salad and smoothies are other enjoyable desserts and/or snacks available over there. Another must-try treat to enjoy when visiting the archipelago is the Guava pastry which is a combination of the jam and shortcrust pastry. Guava seeds have a high amount of dietary fibres that help with gastrointestinal issues such as constipation. Most of households in Guadeloupe Archipelago know that the leaves possess some therapeutic properties. If you want to stop and cure diarrhoea or fever, a tea with the leaves will do the job. The fruit is quite low in calories and fats but carry various vital vitamins, minerals, and antioxidant. It is also a good source of energy, dietary fibres, and vitamins such as vitamin A, vitamin C, niacin, vitamin B6, folate, thiamine, and riboflavin. The naturally high content of vitamin C in guavas is four times higher than the content found in oranges. It also contains essential minerals like copper, manganese and potassium.